Hello! I am a future secondary ELA educator, and I’m always on the look out for books that will help me become the best teacher than I can be. 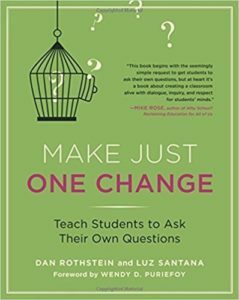 I’ve always thought that students could learn better if they ask their own questions, but find that students often shy away from asking questions. Or, students do not know what questions to ask. However, if students are taught how to ask questions, I think it will definitely help them to learn more in every class that they take. Heather, you would like this book, then. It’s a practical approach for teaching students to learn to ask questions. In high school, I took four English electives with the same teacher. For most of the writing assignments, he gave us a choice of essay questions. However, in one case, he tasked us with writing our own essay question. I had never been told to write an essay question before this. Teachers had asked us to write discussion questions to share in class, but I had never needed to develop a question that would sustain a three-to-four-page essay. If I remember correctly, he had us write open-ended and closed-ended questions on a notecard, and then we shared them as he typed them into a document that was projected on the board. Before starting the task, I feared that I would not be able to generate any essay-worthy questions. This fear stemmed from the fact that I had never really approached a text from the standpoint of inquiry; I had always been trying to write statements in the margins of my books, not questions. The act of writing my own essay question helped change my mindset, allowing me to see the power of asking questions while reading. Because it added nuance to an idea that I had noted while reading, the question that I developed helped me think about the text from a new angle. Furthermore, I felt empowered by my ability to write an essay question – a type of question which had previously always been presented to me by a teacher. I often reflect on this question-writing task when I think about the way that I want to organize my future English classroom. The activity that you describe here seems to be a more structured version of the one in which I participated as a student. Your activity helps students become skilled at developing complex questions from short, seemingly simple prompts, showing them that short statements can inspire deeper thinking if considered from the mindset of an inquiring thinker. All of the skills that come from this activity – generating questions, writing questions, editing questions, and evaluating questions as a group – build students’ critical-thinking muscles and will serve them well in their future schooling and beyond. Thanks for the reading recommendation. I will definitely be buying this book and trying the activity in my class.